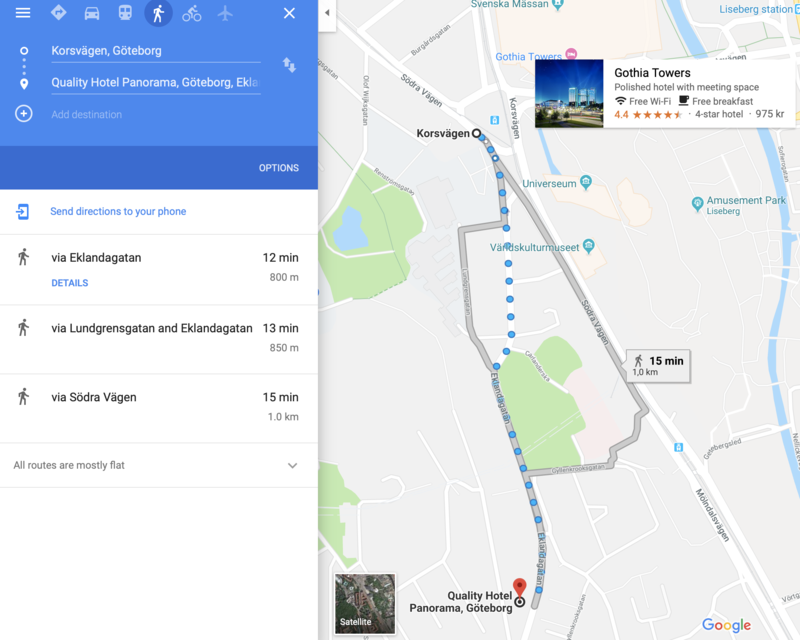 From the airport: if you take a Flight bus (Swe "flygbussen") and go to the Hotel Panorama or to the venue (GU, Lennart Torstenssons gata 8), you should get off at Korsvägen - the first stop. 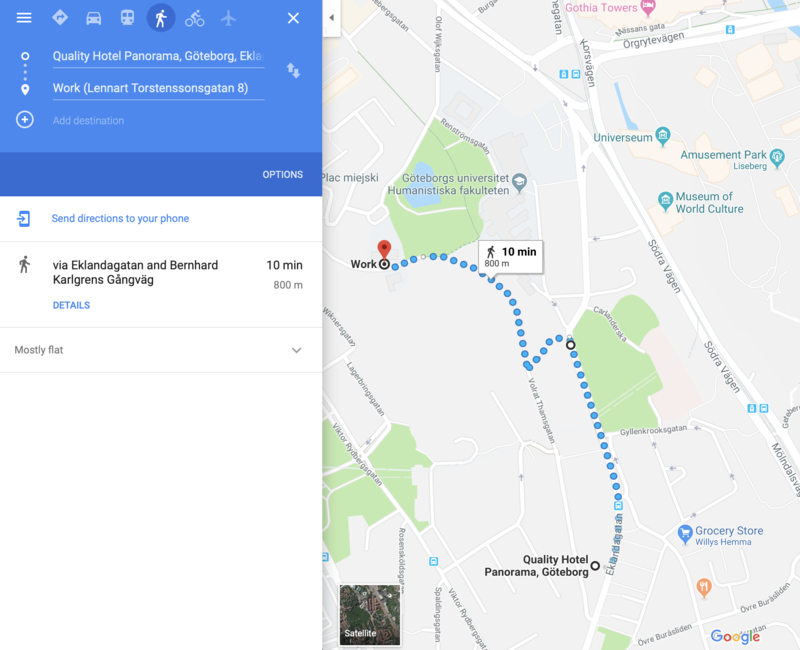 Map Korsvägen - Hotel Panorama. Make sure the Gothia Tower (Svenska Mässan) buildings are behind you. 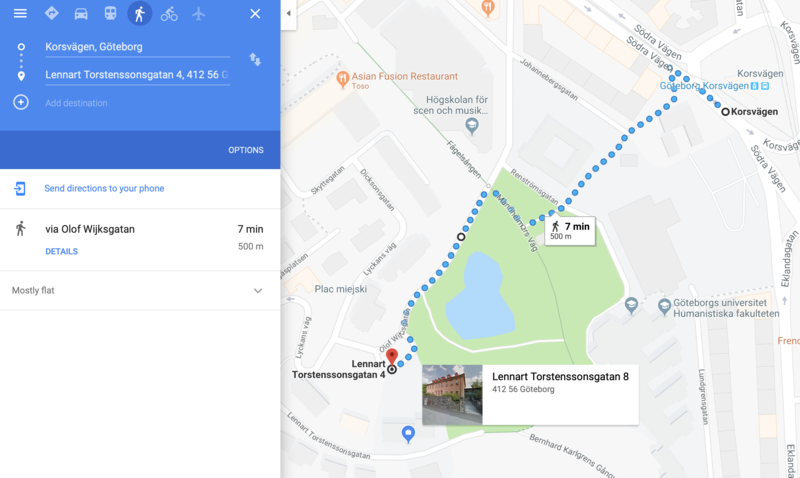 Map Korsvägen - Lennart Torstenssons gata 8. Pay attention that the map leads you to Lennart Torstenssonsgata 4. From there, enter a parking lot through a (pretty narrow) stone fence opening, cross the parking and go up the stairs to the building. We will (try not to forget to) put signs leading you to the meeting room. Map Hotel Panorama - Lennart Torstenssonsgata 8. Note that the turn from Eklandagata on the map leads you to a long staircase that seemingly leads you to a construction site. You go through the park area, and come to the alley where the building for our meeting is (marked as "Work" on the map). We will try to set signs leading you to the meeting room from all possible entry points. If you think this is a scary way - go through Korsvägen instead. It will take 10 more minutes. 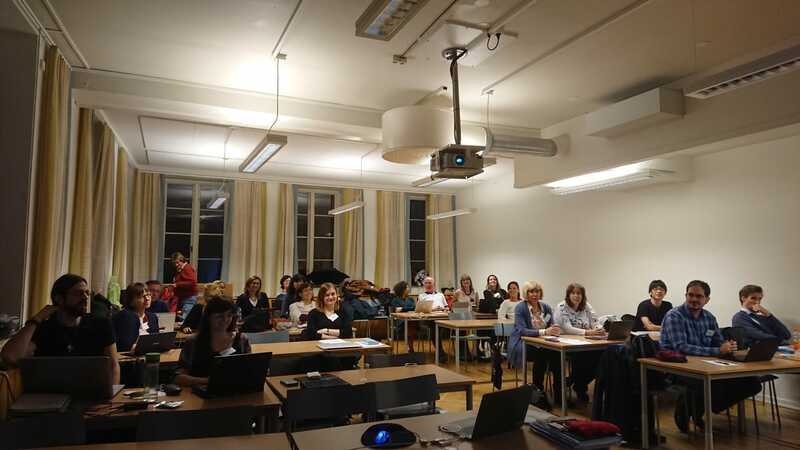 Work Group 1 of enet-COLLECT invites WG1 members (and if funding allows, people outside WG1) to join a hands-on workshop on the topic of "Learning materials through crowdsourcing: teachers, perspectives & scenarios" organized in Gothenburg, Sweden, 5-7 December 2018. This WG1 meeting is aimed at providing a hands-on exercise for the group members. We will test a small-scale crowdsourcing experiment together, as well as introduce all steps from the beginning to the end involved in the process of setting a crowdsourcing experiment. To make it manageable, we narrow the topic to multi-word expressions in second language learning context. Before the meeting, the participants will be asked to complete a crowdsourcing (mini-)task based on English data. The program contains presentations, discussions, individual and group work. Registration is now closed. (To register for the workshop, please enter information into this form. There are quite specific questions there, so count that it might take some time to fill in the form. Members of WG1, and especially WG1 members actively participating in the WG1 tasks, were given priority. The final number of approved/financed participants is 28, and some local people are expected to join us. 9.00-10.30 Presentations and discussions: ideas from the day before. Any potential for cross-lingual experiment? Which idea? Data need? Data availability? Expertise?